On the West Coast of New Zealand’s South Island between Greymouth in the north and Milford Sound in the south are the exceedingly slowly moving massive rivers of ice that are the Franz Josef and Fox Glaciers. When New Zealanders talk about the drama of landscape, they will likely mention the West Coast. Sandwiched between the Tasman Sea and the Southern Alps, everything about the West Coast is dramatic. Advancing glaciers, dense rainforests, fiords, fish-filled rivers, boulder strewn beaches and a history that includes the hunt for precious Greenstone (jade), gold, coal and timber await West Coast explorers. Nowhere in the world’s temperate zones are glaciers as accessible as South Westland’s most famous pair, Franz Josef and Fox. Both descend to levels of about 1000 feet (300 metres) above sea level and are unusual in that they are continuing to advance at a rapid rate. The glaciers are situated on the west coast of New Zealand’s South Island between Greymouth in the north and Milford Sound in the south. 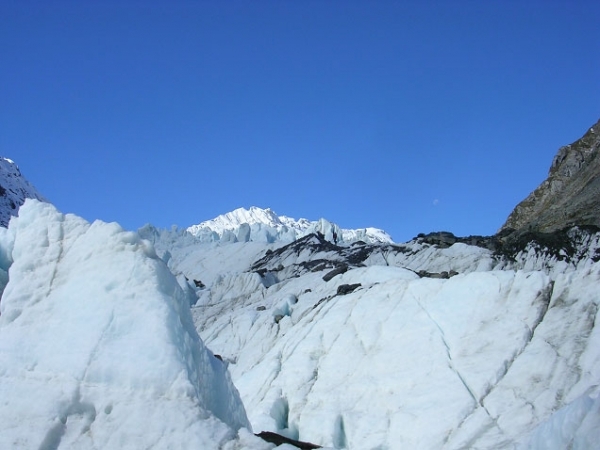 The Franz Josef Glacier, 7.5 miles (12 kilometers) long, lies to the north of its partner and is steeper. 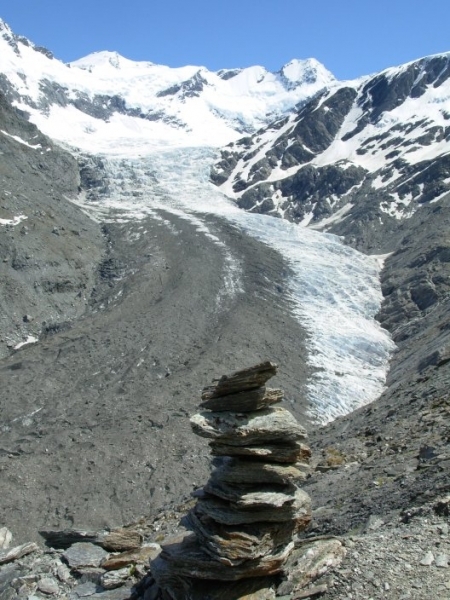 Maori legend applying to the creation of the glacier is beautifully encapsulated in its Maori name – Ka Koimata o Hinehukatere, the tears of the Avalanche Girl. Hinehukatere loved climbing in the mountains and persuaded her lover, Tawe to go with her. Near the top, however, Tawe slipped and fell to his death. The heartbroken girl cried, her tears at such an altitude freezing to form the glacier. Popular trips are available onto the glacier, either by walking with a guide or with a helicopter flightseeing trip. A startling view, not to be missed near the glaciers, is that of Mount Cook and its neighbours from Lake Matheson. If the weather conditions are right, you will see the mountains perfectly reflected in the lake which is surrounded by beautiful native forest. Greymouth is the West Coast’s main commercial centre and largest town. Once the site of a major Maori pa (fort), the town came into prominence during the great gold rush of 1865. The name Greymouth honours Sir George Grey, twice Governor and also Premier of New Zealand. A 30 minute drive north of Greymouth is Paparoa National Park and the famous Pancake Rocks and blowholes. Spectacular coastal scenery, limestone rock formations and groves of nikau palms are a feature of this area. Greymouth is also the arrival/departure point for the famous Tranz Alpine Express rail journey which travels through lush rainforest, the snow capped Southern Alps, spectacular gorges and across the Canterbury Plains to Christchurch. Situated beside the Tasman Sea with a view to Mount Cook and the Southern Alps, Hokitika is the gateway to the South Westland World Heritage National Park. The Arahura River, which enters the sea 5 miles (8 kilometers) north of Hokitika, is a traditional source of pounamu (greenstone) for the Maori people and still yields a large proportion of the Coast’s continuing supply. Several shops in Greymouth and Hokitika sell expertly crafted greenstone jewellery and sculptures. The region is also popular with other craftspeople, including gold jewellers, wood turners and potters. South of Hokitika are two beautiful water-holes. Lake Kaniere is a placid lake surrounded by snow-capped mountains and a favourite place for boating, water skiing, picnics and swimming. Lake Mahinapua, surrounded by bushland, is ideal for sailing and has good camp facilities. A scenic flight with The Helicopter Line is the best way to experience the amazing West Coast scenery – from the wild beaches of the Tasman Sea and the lush native rainforests, to the harsh but beautiful forms of the mighty glaciers marked with ice caves, pinnacles and seracs. Above these glaciers rise the soaring peaks of the Southern Alps with Aoraki/Mt Cook towering above the rest. From their two bases at Franz Josef and Fox Glacier villages, The Helicopter Line offers a range of exciting flights that are an ideal way to explore this largely inaccessible alpine region. For the adventurous, The Helicopter Line offers the unique opportunity to get right up close to the glaciers on a famous Heli-Hike. Flights also depart from Glentanner Park, near Aoraki/Mount Cook Village on the eastern side of the main divide. 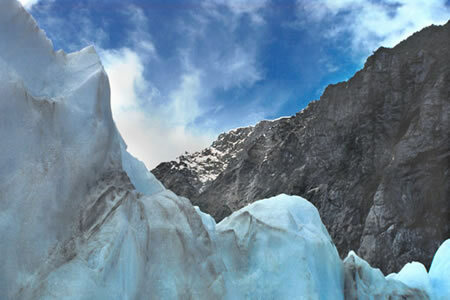 Allow Franz Josef Glacier Guides to guide you through spectacular icefall terrain of the Westland National Park. Protected by their specially designed Ice Talonz glacier footwear, you will go further and see more and experience terrain normally only seen by experienced mountaineers. Enjoy fun and adventure in Greymouth with Dragons Cave Rafting. Float in a galaxy world of glow-worms, slide across underground waterfalls, cuddle through the Love Tunnel and discover enchanting limestone formations. Also enjoy Hot Rock whitewater rafting adventures. Situated 10 kilometres south of Greymouth, Shantytown is a living town built in the style of the exciting gold rush days of the 1860′s. Take a ride on a 100 year old steam train, enjoy a horse and buggy ride, pan for gold, have your photo taken in old style costumes and drink at the local saloon.